Condensation is water that forms on a cold surface when exposed to warm moist air. Depending on the atmospheric conditions, this water may appear as fog, droplets, or frost. Excessive amounts of condensation may drop, drain, or adversely affect a windows appearance and integrity. This may cause wood surfaces to peel, swell, or rot while metallic surfaces may rust or corrode. Condensation forms on a window as warm, moist air touches the cold glass and frame components. Since cold air "holds" less moisture than warm air, water forms on the window surface. 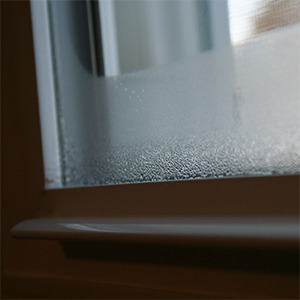 Because windows are a visible sign of this phenomenon, they are blamed for condensation problems. On the contrary, choosing the right window system can help control condensation. Windows made with vinyl frames and sashes can help reduce condensation. Compared to typical aluminum window systems, the interior surface temperature of your windows will be higher because of vinyl's natural insulating qualities. The air immediately surrounding the window will remain at a higher temperature allowing it to retain increased amounts of water vapor. The same is true when comparing insulated glass systems to single pane units. The interior surface of the insulated glass system holds more water, reducing the amount that forms on the window surface. Combine these characteristics with the overall advantages of vinyl windows, and it is easy to see why vinyl window and door systems have become so popular.